Flooding is a detrimental liability that will cause hundreds to thousands (to possibly tens of thousands!) of dollars in damage if you are not covered. It is important to ensure that you are not only covered, but that you have the proper amount of coverage as well. 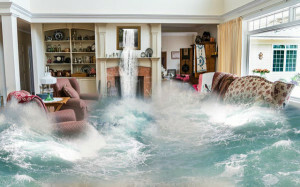 Since flood insurance policies often do not take effect for 30 days after the policy starts, you should make sure you purchase a policy as soon as you move into a new dwelling. Protect your home and belongings before it’s too late!